After April 15, all registration categories will include a $25 late registration fee. To assure that all registration options that you qualify for are available to you, members please log on to the site before attempting to register. Dr. Mascolo will provide an overview of interventions for at-risk learners, based upon the Wiley’s Essentials book for which she is the lead author: Essentials of Planning, Selecting, and Tailoring Interventions for Unique Learners. 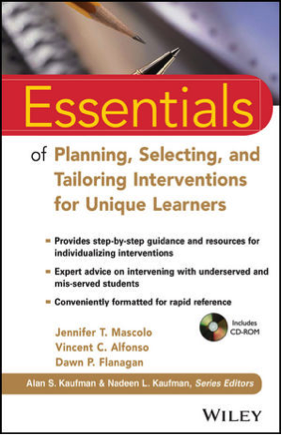 Essentials of Planning, Selecting, and Tailoring Interventions for Unique Learners is an authoritative resource that provides step-by-step procedures for planning, selecting, and tailoring interventions for at-risk learners with a unique focus on how to individualize interventions using actual case examples. This workshop will offer some guidelines for gathering and interpreting assessment data in a manner that assists in identifying targets for intervention relating to specific academic, cognitive, and behavioral manifestations of students with learning difficulties in reading, math, writing, and oral language. Practitioners will also recognize and learn how to intervene with students from underserved and mis-served populations who are at risk for learning failure including English-language learners and students from impoverished environments.